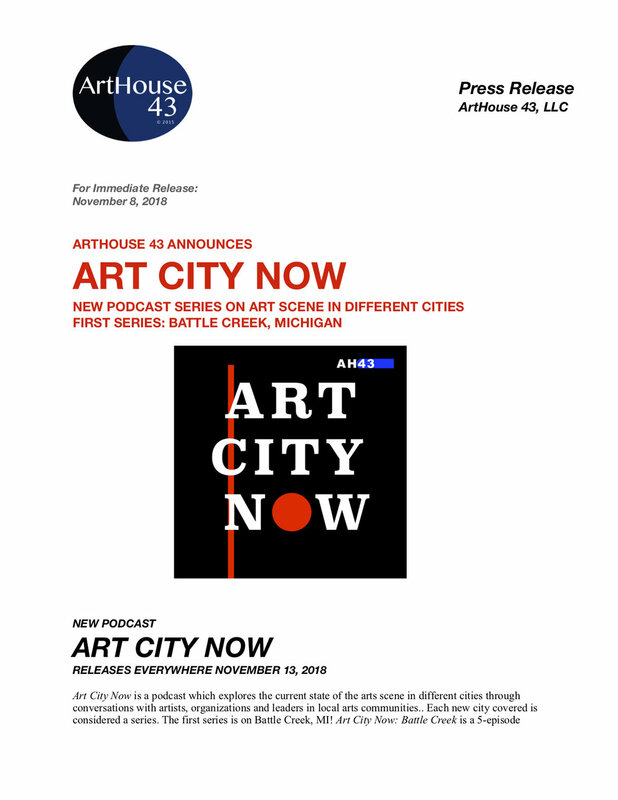 ArtHouse 43's New Documentary Podcast "Art City Now" is OUT NOW! "Art City Now" Podcast Releases November 2018! Art City Now is an audio podcast hosted by Troy Ramos and created by ArtHouse 43 highlighting diverse artistic initiatives in different cities. Each new city covered is considered a ‘series’. Art City Now: Battle Creek will be a 5-episode series devoted to the exploration of the arts scene in Battle Creek. Each 25-30 minute episode will feature at least one artist or artistic voice for a discussion on how they approach their craft and how their work interacts with the Battle Creek arts communities. including ArtHouse Radio, Troy Meets World and, now, Art City Now. Through Art City Now, they want to provide a platform for unifying a sense of connection in the arts communities and beyond. Through theses documentary-styled podcast episodes, which focus on both historical and contemporary aspects of the arts world within Battle Creek, they believe they can contribute to an even more vibrant community. The conversations, information about spaces and artists in the community and the ability for anybody to access these episodes online for free will help the artists and supporting arts organizations in Battle Creek to establish a unique connection with each other. Art City Now will become a platform that not only provides communication and important dialogue between these artists and their community, but will hopefully lead towards building a stronger network of artists and arts organization in the area. Since this podcast is set up to cover the arts scene in many different cities, every city covered would forever have the potential to be exposed to a massive listenership from other local arts communities covered by the show, the larger arts world and people simply interested to know more about the art scene in a particular city. “This could be a massive continued and indefinite support structure for everyone involved”, Ramos says. They also plan to use this network to highlight creative work of a artists from all communities. They are very aware of the depth of the arts scene in the many different communities in Battle Creek. "What a person sees from one perspective in a community is also a part of a larger collective of arts activities. We strongly believe it’s in the best interest of Art City Now and for the Battle Creek community to explore as many different facets of this interesting and diverse cultural arts scene as possible”, adds Ramos. They also want to address some concerns regarding art and its connection to underserved communities through discussion and exploration, and integrating those thoughts into this Battle Creek series.